You know that familiar sensation of bloating, probably all too well. Your belly feels swollen and gassy, like it could pop if hit with a toothpick. Bloating is one of the most common digestive issues experienced by adults in America, but it’s actually within your control! Adding certain anti-bloat foods into your diet is an easy and effective way to reduce bloating. 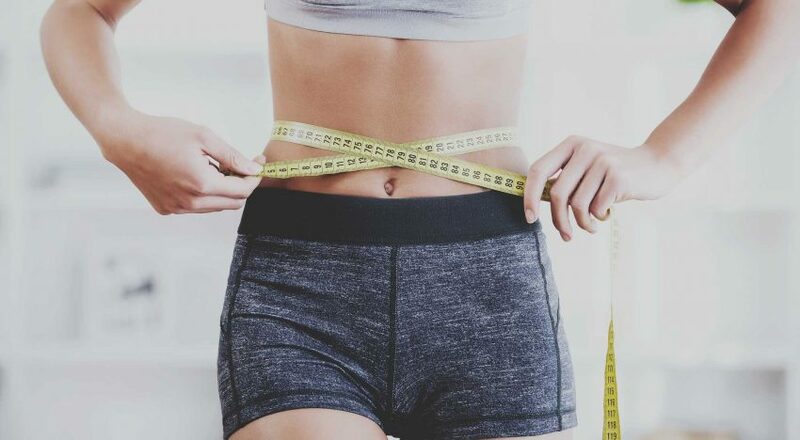 In this article, we’ll discuss how a lean, flat belly can be yours using healthy foods that reduce bloating. Bloating most commonly occurs as a direct result of your diet and gut health. Your digestive system is a long tube that acts like a highway for food. The foods that you eat moves through your GI tract to be digested. Your digestive system uses juices and chemicals known as digestive enzymes to break down proteins, carbohydrates, and fats into smaller molecules of nutrients. When this system works efficiently, the nutrients are absorbed by the blood and transported to cells throughout the body. However, if your body isn’t equipped with all of the enzymes needed to properly digest certain foods, bloating can occur as a result. The bacteria in your gastrointestinal tract love to feast on the carbohydrates your body can’t easily digest. As the bacteria enjoy their meals, they release hydrogen, methane, and other gases that build up in your system. The more gas that builds up, the more bloated you feel. This uncomfortable and sometimes painful condition often feels like an inflated balloon in your belly. Fortunately, you can start eating anti-bloat foods and using supplements to win your battle against bloating. 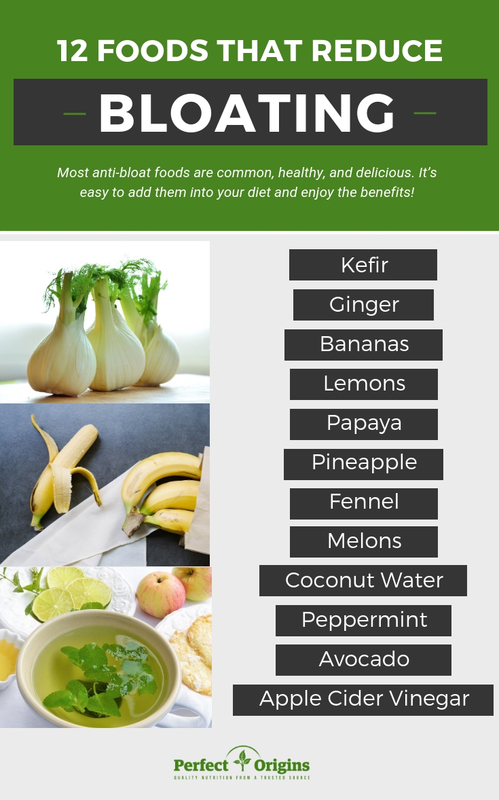 Most anti-bloat foods are common, healthy, and delicious. It’s easy to add them into your diet and enjoy the benefits! Kefir is a cultured, fermented beverage that is often compared to a “yogurt drink” because it is tart, creamy, and loaded with probiotics. You can purchase kefir that is made with dairy milk or popular alternatives like coconut milk, rice milk, and coconut water. It is kefir’s fermentation that makes it such a powerful anti-bloat food. Fermentation uses yeasts or bacteria to transform the food or drink into different flavors, textures, and smells. The process of fermentation also enriches food and beverages with impressive digestive health benefits. Fermented foods like kefir are rich in probiotics, so they can boost healthy bacteria in the GI tract, relieve symptoms of indigestion, and support a smooth and efficient digestion process. This translates into less bloating and more comfort after eating! Ginger is a plant that has been used in fresh, powdered, dried, and liquid forms for thousands of years. In addition to flavoring food, ginger can also be used medicinally. This spice contains phenolic compounds that are known to relieve gastrointestinal irritation, trigger bile production in the gut, and support food as it moves through the GI tract. Ginger also increases the efficiency of certain digestive enzymes, which in turn helps your body break down food molecules and prevent bloating. Bananas are best known for their high potassium content. Potassium is a nutrient that regulates sodium levels in the body. Eating at least one banana on a regular basis can prevent and reduce salt-induced bloating. Ripe bananas are also rich in soluble fiber, which can prevent constipation and the bloating associated with it. The better that your body can eliminate waste, the less likely you are to become bloated. When life gives you lemons, you can do more than make lemonade. You can reduce your bloating as well. Lemon juice has a similar composition to stomach acid, so it can enhance the digestion of food and soothe your bloating away. Lemons also have natural diuretic and laxative properties to keep waste moving through your body. Since eating lemons raw probably doesn’t appeal to you, use lemon water to stay hydrated and enjoy the benefits of this powerful citrus. The papaya is a sweet and vibrant fruit that was once considered exotic and rare. We are lucky enough to have access to papayas all year, which is good news for your stomach. Papayas contain a digestive enzyme called papain. Papain breaks down large proteins into small proteins and individual amino acids. When you nourish your gut with the papaya fruit, you boost levels of papain and stimulate better digestion. Eliminate Wastes & Toxins in Your Body NOW! Do you suffer from intestinal aches and pains? Are your cholesterol levels through the roof? Do you have unwanted fat? CLICK HERE TO LEARN MORE ABOUT PERFECT FLUSH. Similar to the papaya, pineapple also contains an enzyme that aids in digestion and reduces bloating. This anti-bloat food is rich in bromelain, which is known to reduce inflammation and break down proteins for easier digestion. Just a cup of fresh or frozen pineapple provides enough bromelain to stimulate the digestive process and ease bloating. This ancient Mediterranean plant offers a licorice-like flavor and an abundance of health benefits. Most notably, fennel’s fiber content — 7 grams in just one raw fennel bulb — promotes regularity for a healthy digestive system. Fennel also functions as an antispasmodic agent in the colon which relaxes the muscles in the digestive system so that excess gas can dissipate. You can take advantage of this anti-bloat food by incorporating it raw into your food, drinking fennel tea, or finding a high-quality fennel supplement. Melons like cantaloupe are low in calories, rich in fiber, and high in water content, which makes them the perfect healthy snack and digestive aid. Eating cantaloupe on a regular basis will help you maintain digestive regularity and reduce the risk of bloating. Coconut oil had its time to shine, and now coconut water is emerging as a popular health food. Coconut water has a sweet, nutty taste. It is low in calories, high in potassium and fiber, and very hydrating. This combination makes coconut water a powerful digestion tool. By balancing sodium levels, keeping the body hydrated, and nourishing the gut with fiber, coconut water functions as an excellent anti-bloat food. Peppermint is a versatile herb that has been valued for its medicinal properties since ancient times. Just like the Egyptians, Greeks, and Romans, you can utilize peppermint in leaf, oil, or tea form to improve your health. Peppermint reduces bloating with its anti-inflammatory, antispasmodic, and soothing properties. Peppermint oil is an especially powerful anti-bloat treatment because it is concentrated. Just a few drops of peppermint essential oil mixed with water can relax the muscles of your intestines to reduce bloating and gassiness. The avocado is the darling of the health food niche, and for good reason. Avocados are a great source of healthy fat, fiber, and potassium, all of which support healthy digestion. Add avocado to your salad, smoothie, or sandwich to ease water retention, reduce constipation, and minimize bloating. Apple cider vinegar supports digestion for a few different reasons. It is a fermented food, which makes apple cider vinegar rich in gut-friendly probiotics. The acidic nature of apple cider vinegar also nourishes the GI tract with enzymes that encourage healthy digestion. Together, these factors minimize the effects of bloating after eating. Just be sure to use organic, unfiltered apple cider vinegar that contains the “mother,” which is the collection of proteins, enzymes, and healthy bacteria that contain the bulk of health benefits. Regularly eating foods that reduce bloating is an important part of a healthy and gut-friendly lifestyle. However, sometimes not even the healthiest foods can eliminate serious gastrointestinal distress. Activated charcoal is a unique substance that can be used to supplement your anti-bloat foods. Activated charcoal binds to toxins in the stomach so that the body can’t absorb them. It adsorbs toxins to pull them out of the body. If you feel bloated, a dose of activated charcoal begins working within 20 minutes to bind the byproducts of food that cause gassiness. You can even take activated charcoal proactively, about one hour before a meal that you know will leave you feeling bloated. However, if your bloating has become a chronic problem, activated charcoal and foods that reduce bloat may not be enough. You may need a daily supplement or strong colon cleanse to rejuvenate your digestive system. Perfect Origins Perfect Flush is a natural fiber supplement formulated with 100% pure psyllium husks, bentonite clay, black walnut hull powder, and other ingredients proven to cleanse the colon. Using Perfect Flush on a daily basis promotes a healthy digestive tract so that you can maximize your health and wellness. Can Your Body Detox Itself? Common Health Myths, Busted!